What is the reason for numbness and tingling of the lip and chin due to a tooth infection? 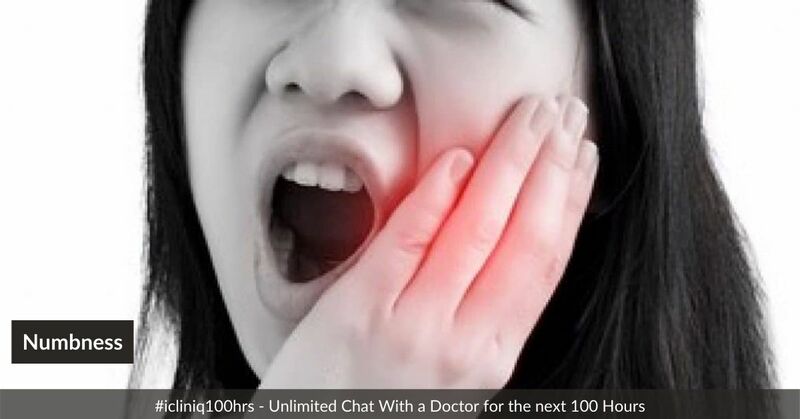 iCliniq › Ask a doctor online › Answers › Neurology › Numbness › I have numbness and tingling of the lip and chin due to a tooth infection. When will it get normal? Q. I have numbness and tingling of the lip and chin due to a tooth infection. When will it get normal? Answered by Dr. Hitesh Kumar and medically reviewed by iCliniq medical review team. The last molar on my left side broke around two years ago. It slightly niggled and chipped further during that time, reminding me that it needed to be fixed, but never actually posed a problem. I finally went to the dentist last year and an X-ray was taken. A decay was present at the roots, and I was referred to an endodontist and a root canal treatment was the suggestion. The dentist did a temporary filling, which fell out soon after. The tooth appeared settled, and I had delayed taking an appointment with the endodontist. Two months ago, I started to feel sensations of extreme nerve pain, when a pressure was put on the tooth, and it was getting worse after a few days. But, it settled again. Finally, I took an appointment with the endodontist. He took an image of the tooth and said that it could not be saved, and extraction was the only option. The tooth was alright except for the occasional jolt of pain. Last week, I was awakened many times at night with a dull toothache. It progressed to the next day. I took Neuropin and Panadol for pain relief. The pain then changed to a throb and was increasing. I had a packet of Keflex with the worry of an abscess. Four days ago, I had sudden numbness from under my left lip over my chin. I rang my endodontist on the next morning, and he organized to have the tooth removed the same afternoon. On the day after the extraction, the numbness was still there. Four days later, I am still numb. I now get tingles a few times a day. I do have the slight feeling of pressure or touch on the numb chin by running my fingers over it. I have read so many horrible things about numbness of the chin. • Is it normal to have numbness and toothache after pulpectomy? • Got a swelling post-extraction. Why has it not reduced? • I have swelling and numbness after mandible surgery. How long will it take to subside? Possibly there been some compression or inflammation of the inferior alveolar nerve, which passes through the mandible and then emerges as the mental nerve. The mental nerve supplies the part below the lower lip and chin. If you have pain, severe tingling, pins and needle sensation in the supplied area, then few medications like Gabapentin can be of some help. But, it is the impaired sensation which is bothering you. I suggest you visit your dentist to check if anything further can be done. The chin had spontaneous numbness, at about the same time the infected tooth was getting worse. So, does the tingling sensation indicate that my nerve is repairing? How long can this sensation go on for before the numbness goes? It has nearly been a week. Tingling pins and needles sensation means that there is a lesion at the concerned nerve. There is either a compression, inflammation, nerve fiber damage or a demyelination. It does not signify nerve repair. The time limit cannot be predicted. It will reverse if the lesion is removed or healed. It could also last for weeks to months. If an irreversible damage has occurred to the nerve, it can even be permanent. I had an abscess on the decayed second molar, and it had to be extracted urgently. Since the extraction, I am getting the tingling sensation. I just want a second opinion. The top layer of my skin responds to touch. The infection should heal with appropriate antibiotics or drainage. The response of the numbness at the chin will depend on whether the infection caused a permanent or transient damage to the nerve. If it was severe and there is permanent damage, the numbness may persist too. Thank you for replying. Luckily, the surgeon said that there was no permanent damage to the nerve. That is great news. Let us hope then, that there is an improvement in the numbness. You can ask your dentist about taking a short course of steroids, like tablet Prednisolone, for controlling inflammation around the nerve. This would be possible only if he feels the infection is well under control, and there is a negligible risk of worsening of the infection due to the steroids. Last night I had a slight burning sensation as well. The gums under the teeth on the left front side are also sensitive. What are the sensations one can expect when the nerves are repairing? Impaired or diminished feeling to touch. If the nerve is healed or repaired, such impaired sensations should also subside, whereas if there is some residual damage to the nerves the impaired sensations may persist. Why have other doctor or specialist suggested that tingling after numbness is a sign of nerve coming alive. I spoke to someone with a similar experience they even got pain on the healing process. I do not know why they suggested that tingling after numbness is a sign of nerve coming alive. I try to explain things. If you are having tingling or pins and needle sensations or pain in a nerve area that signifies that the nerve is having some problem such as irritation, inflammation, compression or any other. Such feelings can occur to a patient even if the nerve is completely cut and it is called phantom limb. If those sensations start subsiding and you start to feel normal sensations over that area, that will signify that nerve is improving. When I apply a light touch, it is sensitive now. I can fell most sensation from pinprick to light touch even a hair. Just heightened sensitivity, even a little pain. What to expect when a nerve is rejuvenating? If you started to feel pinprick, sensation, touch sensation over the area in which before you had fewer feelings, that signifies that the nerve is getting better. How to manage abscessed tooth? I have pain on the left side of the jaw. Is it due to an impacted tooth or a tooth with large filling? I have an abscessed tooth with swollen face. Is it serious?